Every year, the city of Plattsburgh celebrates it's famous battle of 1812. This year was their bicentennial! For the whole weekend, the city is bustling with activities include re-enactments. 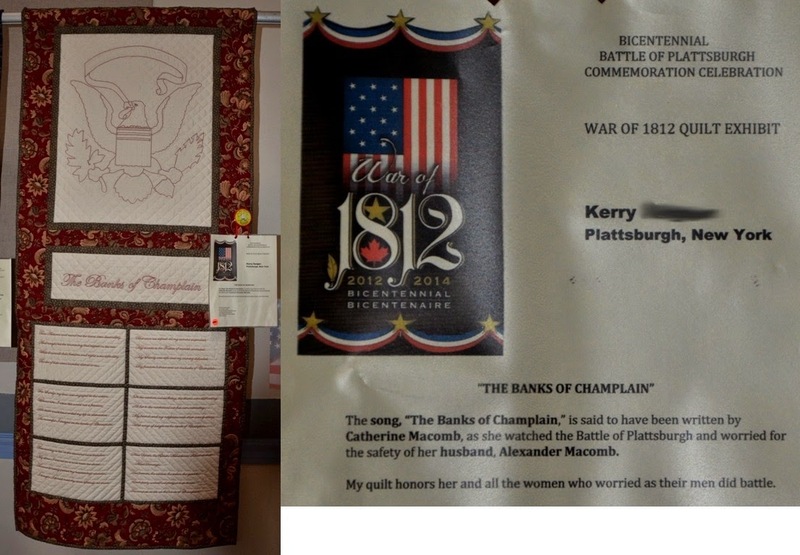 This year, in celebration of the bicentennial, a War of 1812 quilt exhibit was organized by Jean and Linda. Many of these quilts had personal family history related to the battle itself, and for those having no link to this historical even, quilts were created as a token of gratitude to America's past and present service men and women. Allow me to share some of these beautiful quilts, many of which are Fibre Junction customers. This quilt is from Susan - Stars and Stripes Forever. Here are a few more for your enjoyment. Thank you for taking the time to visit my little corner in cyber space! Cheers! Sounds like a fun event and a wonderful way to celebrate with quilts from the past and present. Sounds like fun! Great quilts. Wow -- looks like a fun celebration -- you have some talented customers! Hey, Carole! I just saw my quilt here--thanks for including it (and for helping me pick the fabrics)!